E. Van Beneden (1876) proposed the name "Mesozoa" for the dicyemid as an intermediate between Protozoa and Metazoa in body organization . The dicyemid mesozoans are the commonest and characteristic parasites of the kidney of benthic cephalopod molluscs. The dicyemid bodies consist of only 10 to 40 cells, which are fewer in number than in any other metazoans, and are organized very simply. They have neither body cavities nor differentiated organs. The life cycle of dicyemids consists of two phases of different body organization (Fig. 1): (1) the vermiform stages, in which the dicyemid exists as a vermiform embryo formed asexually from an agamete, and the final form, the nematogen or rhombogen, and (2) the infusoriform embryo which develops from a fertilized egg. The name "dicyemids" is derived from the fact that they produce two types of embryo in the life cycle. A high population density in the cephalopod kidney may cause the shift from an asexual mode to a sexual mode of reproduction (Lapan and Morowitz, 1975). Vermiform stages are restricted to the renal sac of cephalopods, whereas the infusoriform embryos escape from the host into the sea to search for a new host. 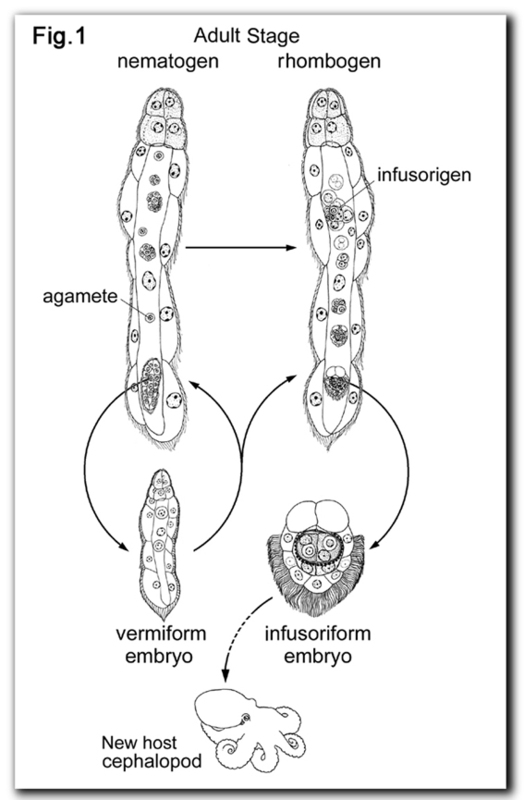 However, it remains to be understood how infusoriform embryos develop into vermiform stages in the new host. More than 100 species of dicyemids have been recognized in about 50 species of benthic cephalopods of the world. Dicyemids distribute in a variety of geographical localities: Okhotsk Sea, Japan sea, Western and Eastern North Pacific Ocean, New Zealand, Mediterranean, Western North and Eastern Atlantic Ocean, Gulf of Mexico, and Antarctic ocean (Nouvel, 1947; McConnaughey, 1949; Hochberg, 1990; Short, 1991). Usually two to three species of dicyemids are found in each host cephalopod species or each individuals (Furuya, 1999). Most of the dicyemid species are host-specific (Furuya, 1999). In a few instances, dicyemids belonging to the same species of dicyemid are detected from two different cephalopod host species, different genera, or even different orders. 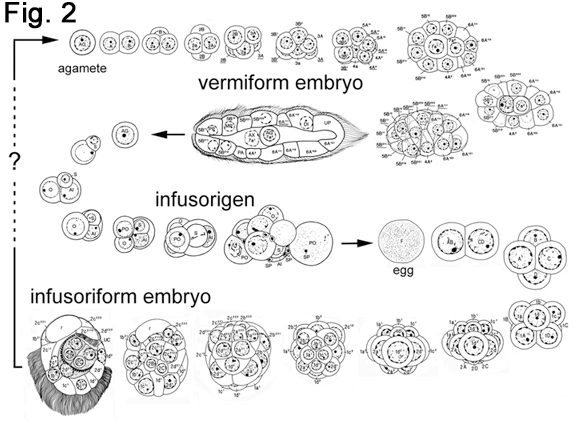 Vermiform stages, namely, vermiform embryos, namatogens, and rhombogens, are similar in shape (Fig 1). On the surface of the kidney (renal appendage), individuals of vermiform stages insert their heads into renal tubules (Hochberg, 1990; Furuya et al., 1997). The surface of the dicyemid body possesses numerous cilia and the folded structure, which is believed to contribute to absorb nutrients more efficiently. The body of vermiform stages consists of a central cylindrical cell called the axial cell and a single layer of 8 to 30 ciliated external cells called the peripheral cells. The number of peripheral cells is species specific and constant. At the anterior region, 4 to 10 peripheral cells form the calotte, of which cilia are shorter and denser than in more posterior peripheral cells. The calotte shape varies, depending on the species, and might be resulted as an adaptation to attach to the various regions of host renal tissues. Infusoriform embryos mostly consist of 37 or 39 cells, which are more differentiated than those of vermiform stages. Internally, there are four large cells called urn cells, each containing a germinal cell that probably gives rise to the next generation (Fig. 1). At the anterior region of embryo, there is a pair of unique cell called the apical cell, each containing a refringent body composed of the magnesium inositol hexaphosphate. Posteriorly, external cells are ciliated. The bodies of vermiform stages might be simplified as a reflection of their specialization in their parasitic habitat composed of renal tubules (Nouvel, 1947). By contrast, infusoriform embryos seem to represent the true level of organization because they become free-swimming organisms (Furuya et al., 1997). Nevertheless, the body organization of infusoriform embryos cannot be regarded as achieving the grade of tissue level. The patterns of cell division and the cell lineages of the two types of embryo were described in Dicyema japonicum (Furuya et al., 1996, see Fig. 2). The infusoriform embryo develops from a fertilized egg. The early cleavages are holoblastic and spiral. At around the 20- to 24-cell stage, cleavages become asynchronous and the cleavage pattern changes from spiral to bilateral. The fully formed infusoriform embryo consists of 37 cells and exhibits bilateral symmetry. The vermiform embryo develops asexually from an agamete (axoblast). Cell division proceeds spirally in the early stages, becoming bilateral after the fifth cell division. The fully formed vermiform embryo consists of 23 cells and exhibits bilateral symmetry. During the development of both types of embryo, a few cells consistently undergo extremely unequal divisions; the smaller daughter cells degenerate and ultimately disappear during embryogenesis. This may be an example of programmed cell death. The cell lineage appears to be invariant among embryos, apart from the derivation of a few cells produced at the latest stages of development. The development of the functionally hermaphroditic gonad, the infusorigen, and gametogenesis were described in some species of dicyemids (Furuya et al., 1996). In D. japonicum, after only three rounds of divisions of an agamete, an oogonium and spermatogonium are produced. The oogonia occupy the outer surface of the axial cell of infusorigen and spermatogonia are incorporated into the axial cell of infusorigen. The spermatogenesis proceeds within the cytoplasm of the axial cell. Mature spermatozoa without tails escape the axial cell and fertilize the primary oocytes. The development of dicyemids appears to be the simplest type of development in the animal kingdom. It is a characteristic feature of dicyemids that both the reproduction and development occur within the cytoplasm. After van Beneden's opinion, Nouvel (1947) considered dicyemids were degenerated from metazoans such as trematodes, because of the adaptation for the parasitic life style. Phylogenetic analyses using nucleotide sequences of 5S rRNA suggested that dicyemids diverged early among primitive metazoans such as sponges, cnidarians, and flatworms (Hori and Osawa, 1987). To the contrary, the analyses using nucleotide sequences of 18S rDNA suggested the dicyemids are rather degenerated triploblastic animal (Katayama et al., 1995). Recently, Hox gene sequence data were analysed to investigate the phylogenetic affinity of dicyemids (Kobayashi, et al., 1999). They suggested dicyemids are members of spiralians such as turbellarians, nemerteans, annelids, and molluscs. It is still not clear whether dicyemids are primitive multicellar organisms or degenerated metazoans. However, current molecular phylogenetic studies support the suggestion that dicyemids are related to true metazoans.